← More Look Back Articles by Earl Ball!! Do Enjoy. Michael And Ivone are getting Married on March 12, 2004 at 18:00 at the “Always and Forever” Chapel in Las Vegas and you are invited ! ** This was their actual Wedding Invitation Received by Stan and Lois Feb 10, 2004!!! See below for More Pix AND Breaking News!! Photo above was the formal introduction of Ivone to the International Shuffleboard Community. 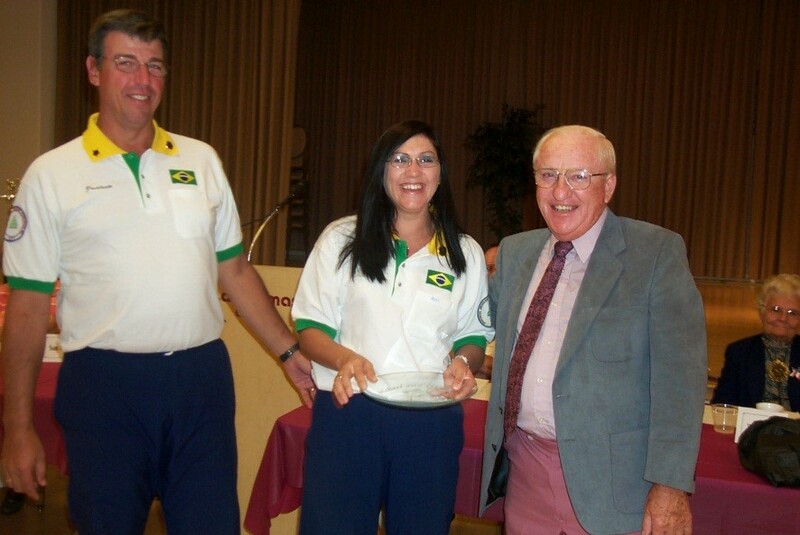 The introduction took place in Mesa, AZ on the occasion of the 2004 ISA Team Tournament. The gentleman doing the Intro is the then ISA President Joe Messier. Our sincere best wishes to Ivone and Michael. Stan McCormack for Shufflers of The World. 2019 03 12.